My Ivy-educated, strawberry-blonde sister-in-law Cele has a dry wit and too many talents to itemize, though right up at the top of the list would have to be baking (which she’d deny) and her signature Christmas Cookie Platter. Such precision! 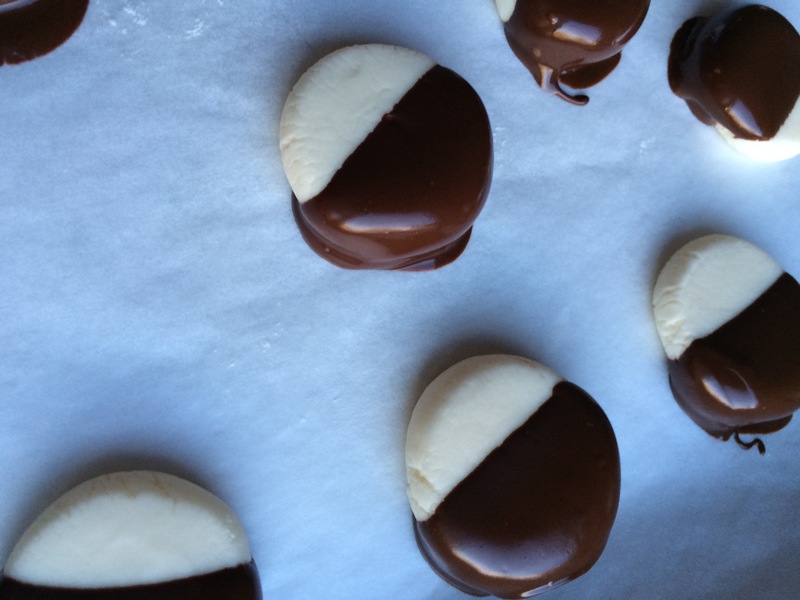 Every cookie is perfectly uniform, as if each dough ball were weighed and measured before being shaping into a crescent or whatever. 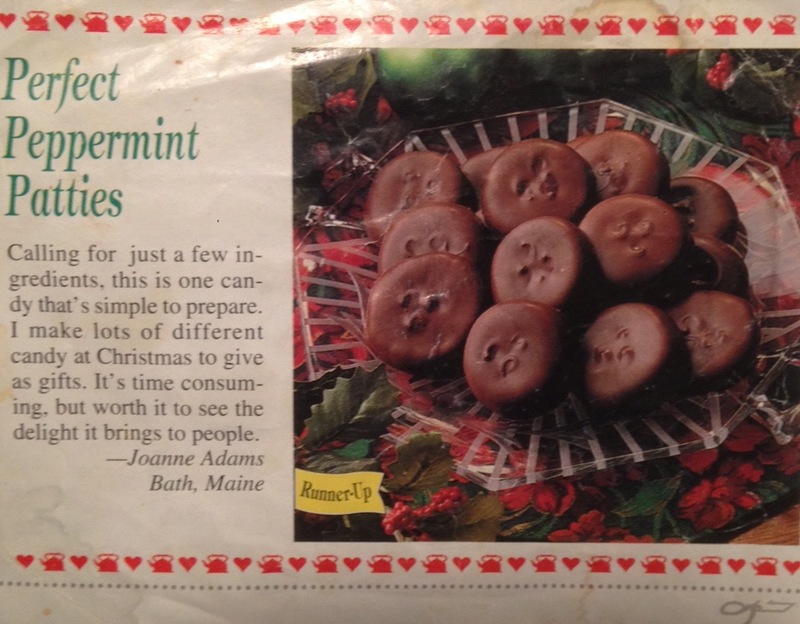 And for me, the stars of Cele’s famous Platter (and the first to disappear) are her quarter-sized, chocolate-dunked peppermint patties. Her patties are perfectly portioned and shaped, like they rolled right off the assembly line, and are evenly enrobed in silky dark chocolate. 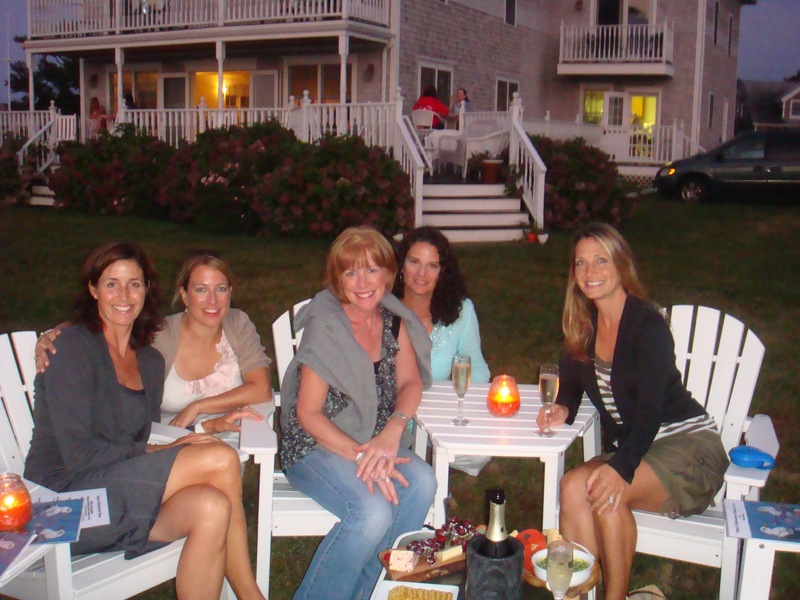 When I asked Cele if I could feature a (very slight) variation of her recipe on my blog, she dutifully admitted that the original recipe came from a magazine – “maybe Taste of Home?” But Joanne Adams of Maine should get the credit. I’ll take the credit for this “festive” version, though. Cute, right? 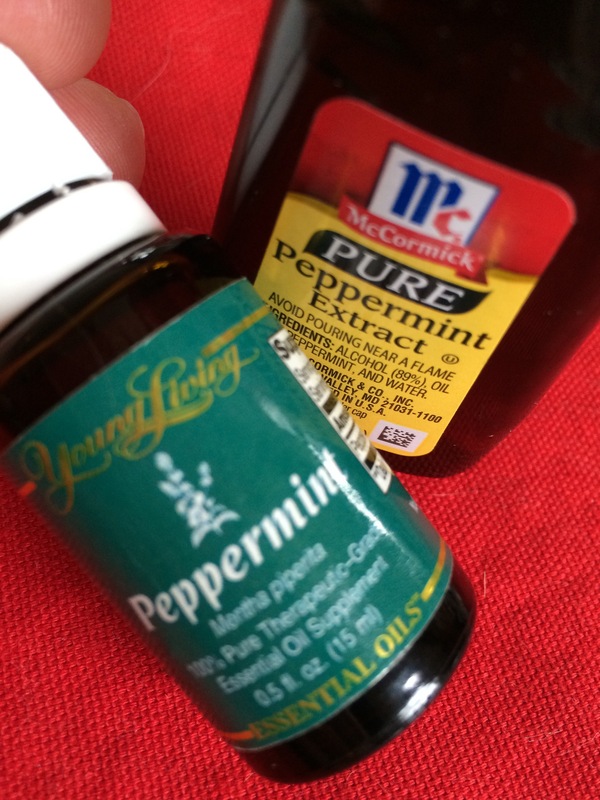 The first time I tried making my own peppermint patties, I used 100% pure peppermint essential oil – the kind that you can get at Whole Foods or health food stores. Whoa! WAY too intense for my taste. (Though some testers really liked the strong mint hit.) If you want to use essential oil in place of extract (which is essential oil diluted with alcohol and water), only use a few drops. 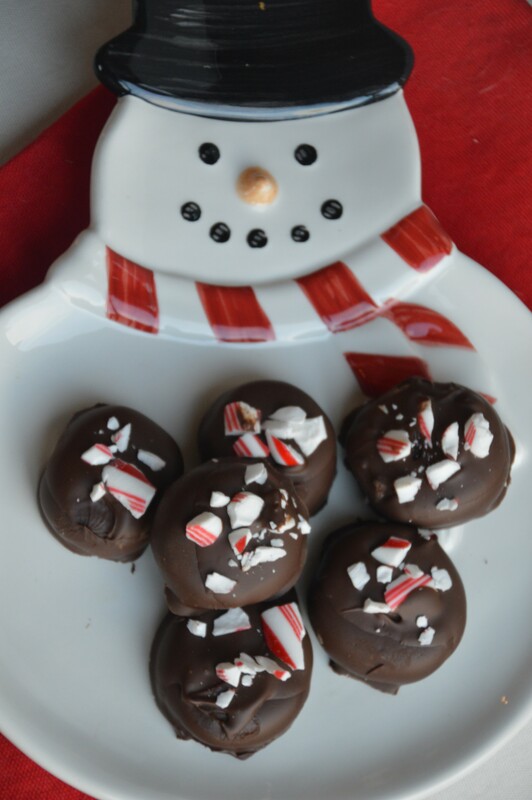 Of course, the beauty of this recipe is that you can adjust things to your taste – more or less mint flavor (just taste the mixture as you go), pure dark chocolate or a mixture, festive candy cane sprinkles or au natural. Cele likes her chocolate coating deep and dark; I add some Hershey’s milk chocolate Mini Kisses to sweeten it up a little. 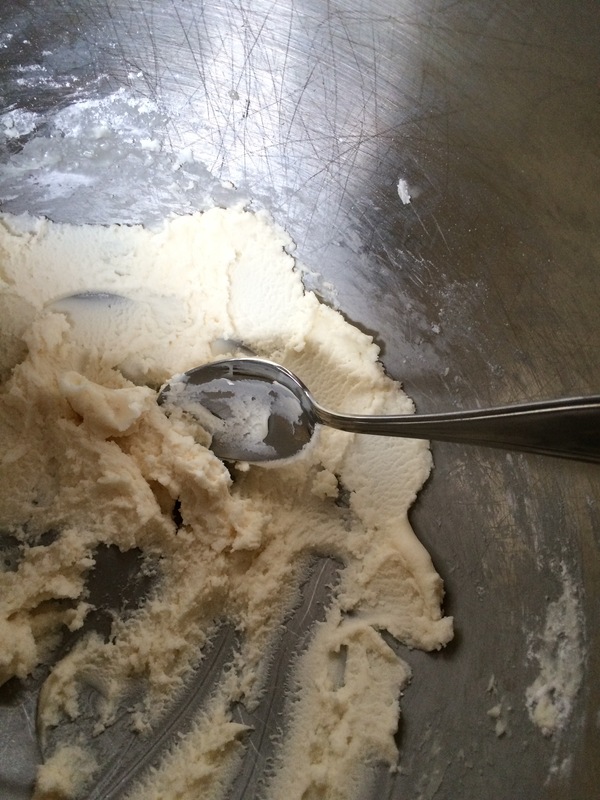 To the bowl of a standing mixer fitted with a paddle blade, add confectioner’s sugar, butter, peppermint, and vanilla. Starting on low (to avoid a shower of powdered sugar) and increasing to medium and beating until mixture starts to come together. 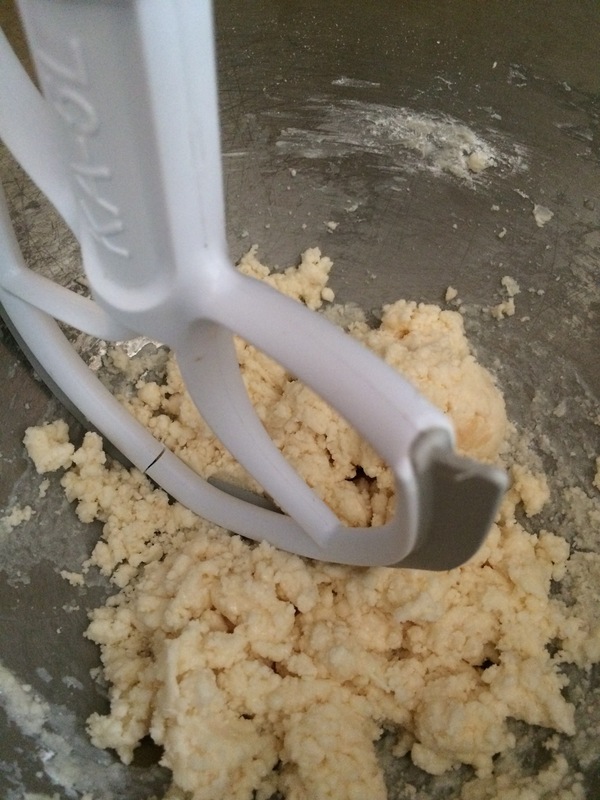 Using a mixer makes it easier to get a smooth dough, but you could also mix by hand. This tastes like a thick, minty frosting – yum! 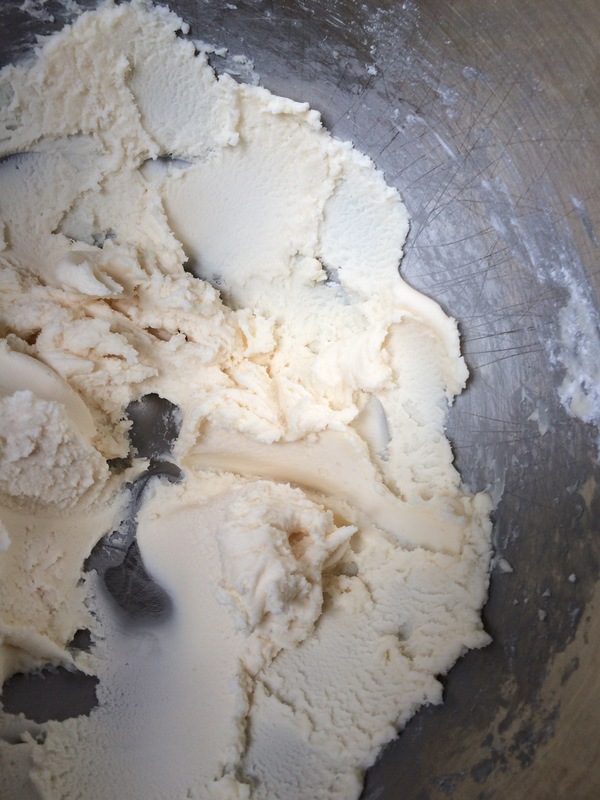 If dough seems too wet to roll/work with, stir in a little more powdered sugar; it should have the consistency of stiff frosting. 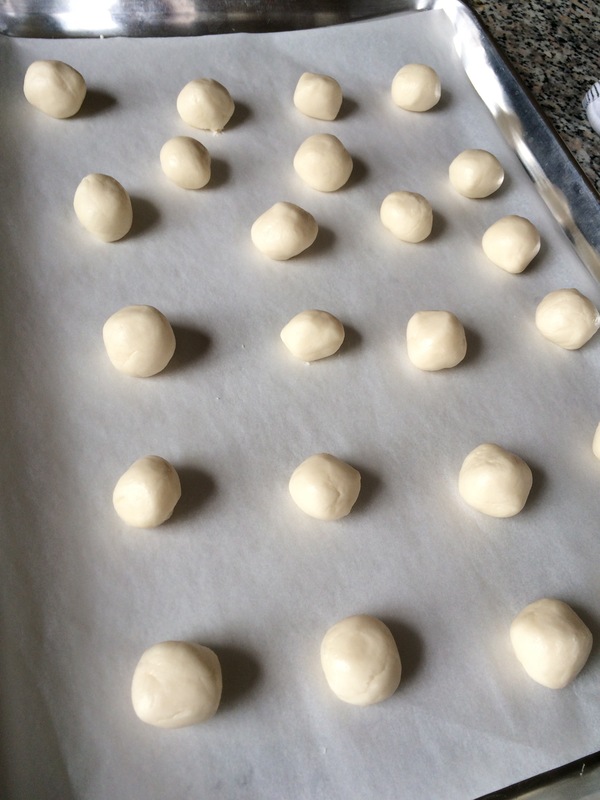 Roll dough into balls – somewhere between the size of a hazelnut and the size of a walnut (slightly less than 1” balls) – and place on baking sheets lined with parchment or wax paper. 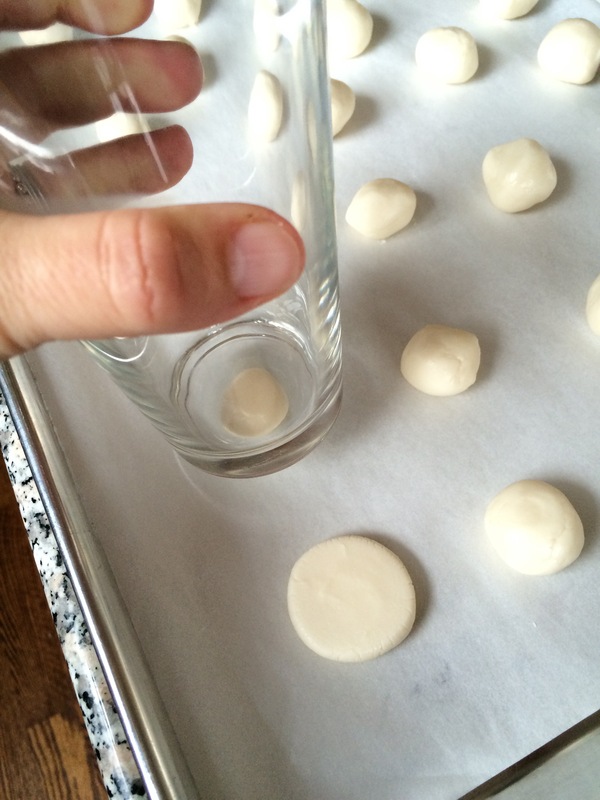 Flatten balls with a flat-bottomed glass to form centers about ¼” thick. (If glass sticks, dust balls with more powdered sugar.) Refrigerate about 20 minutes until firm. While centers are chilling, unwrap candy canes and place in a zip-top bag. 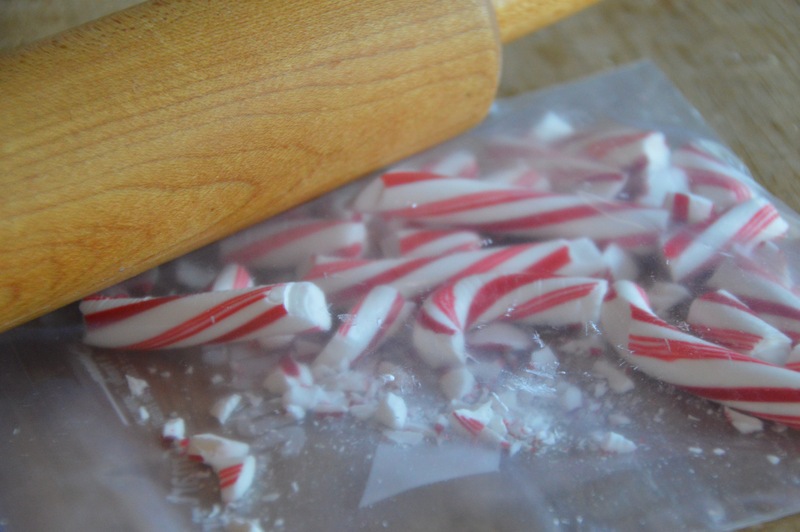 Crush with a rolling pin or wine bottle to make festive candy sprinkles. I MIGHT have dipped a banana, and a few fingers, in the leftover chocolate . . . 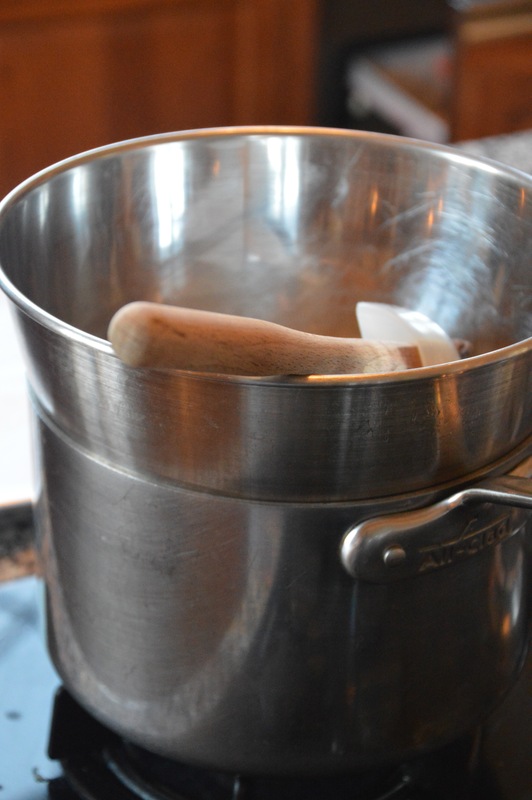 This is my double-boiler: a bowl set over a pot with about 2″ of water in the pot. 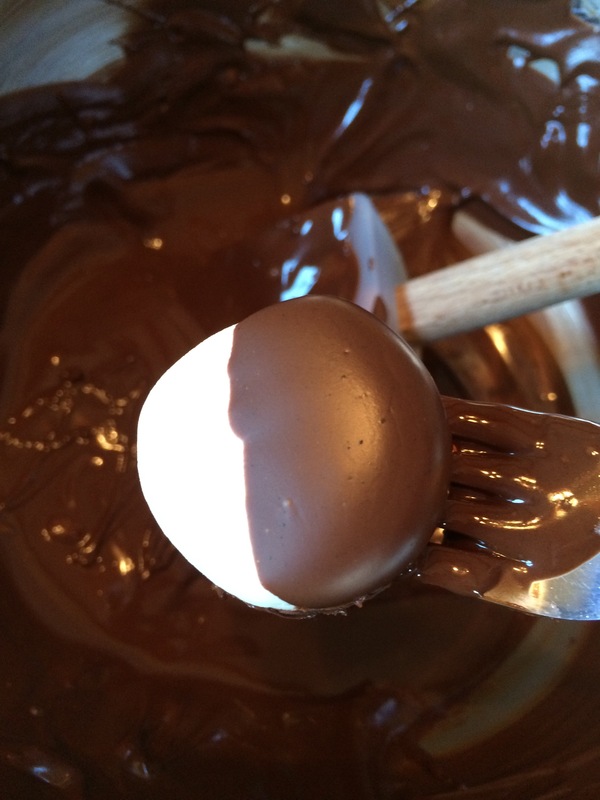 In a microwaveable bowl, or in the bowl of a double boiler placed over simmering water, melt the chocolate chips and shortening. 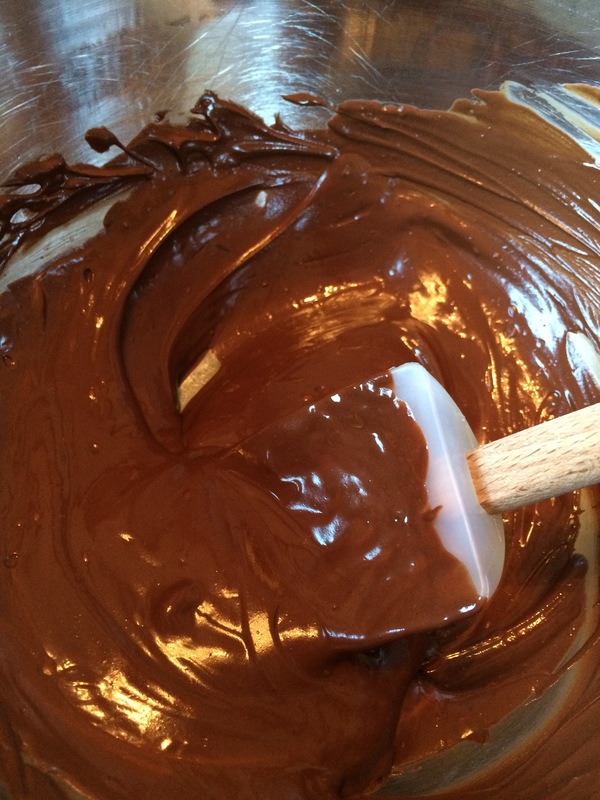 (The shortening makes the chocolate easier to work with.) 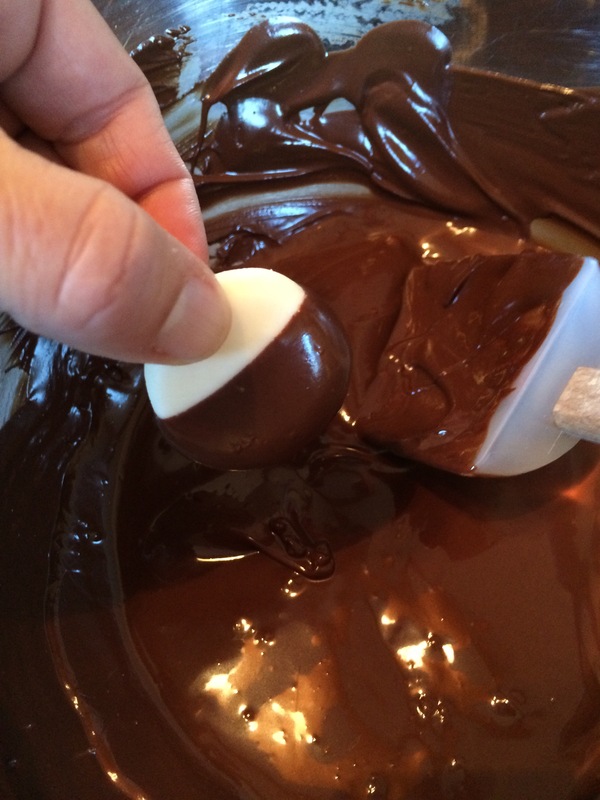 If microwaving, zap in 30-second intervals, stirring after each time, until chocolate is melted. Cele’s trick for dipping the patties in chocolate is to dunk half of each patty in chocolate and then place back in the refrigerator to harden. 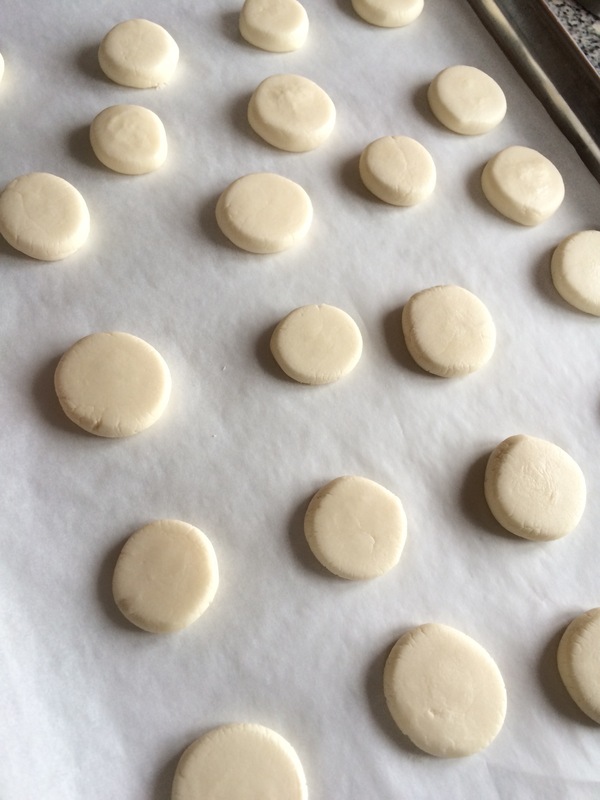 Then she dips the other half and places them back on the wax paper or parchment-lined sheet. I tried some this way, and because the chocolate hadn’t fully hardened, I got fingerprints on the patties. Not chic. So I dipped half like Cele does, and then used a small fork to dip the other half. No fingerprints! Back into the fridge to harden. 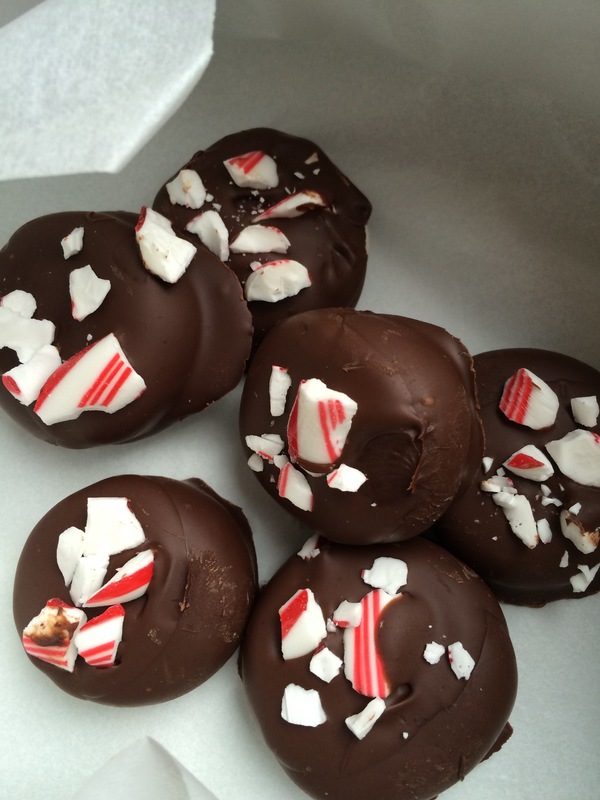 After the second half has been dipped in chocolate, sprinkle with candy cane pieces, if desired. Notice the fingerprint in this front patty! This was before I switched to the fork-dunk method. Return patties to the fridge. After about an hour, or when chocolate is hard to the touch, patties can be packaged in an airtight container. Any chocolate “tails” can be snapped off at this point. Cele probably has a way to dip without getting chocolate tails, but she opted not to share that secret with me. . .
Best stored in the refrigerator or freezer until ready to serve. To use for a cookie swap, place patties in pretty mini muffin liners. IMPORTANT COOKIE PLATTER NOTE: When baking and/or freezing several types of cookies and candies for holiday platters, be sure to store each kind wrapped separately. Avoid the disappointment of minty-tasting snickerdoodles or almond toffee! 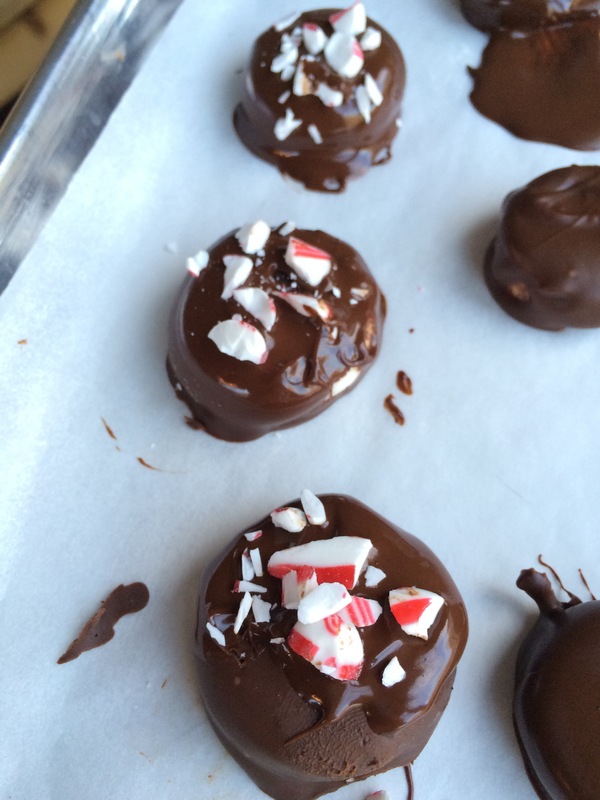 This entry was posted in Cookies, Desserts, Holidays and tagged candy, chocolate, gluten-free desserts, holiday cookies, holiday gifts, no-bake desserts, peppermint by subeeskitchen. Bookmark the permalink. Ok Sue, clearly sounding a hell of a lot awesomer on paper, or blog, as it were, I now dread disappointing anyone who should meet me in the flesh! Yikes! I’ll never live up to your too kind hype!!! I am, however, digging your hip dipping tricks and agree that deep and dark is my personal preference:) You are my holiday candy crush! Mwah! seriously, i’m scared to introduce my husband to this recipe… and with a bottle of cheap wine… makes for a good night!! Loved seeing your blog – thought tooth jarring comments were hilarious but like the candy cane addition. You’ve always been my holiday candy crush, but I think I’m crushing on Cele now too. Good recipe grab !! Both of you – as it turns out ! Love the pattie recipe! 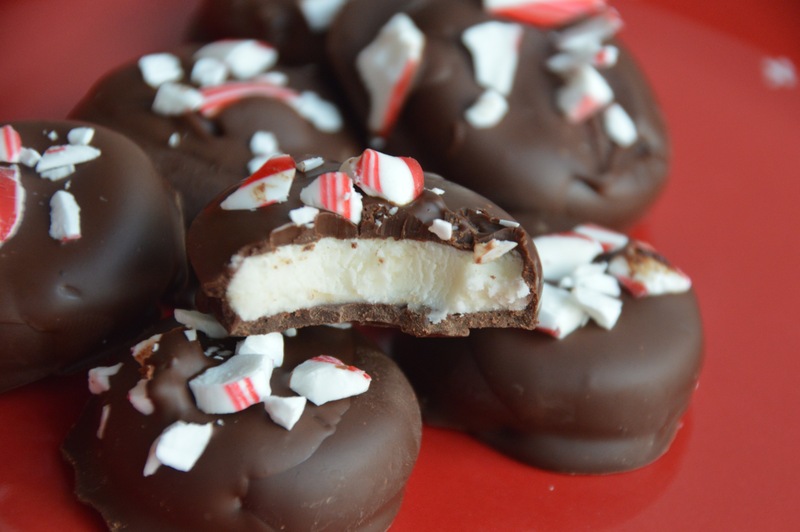 Going to make them for Christmas, my Morristown relatives will love them. I am working on a recipe for Sugar Glider Cookies! These are my soon-to-be favorite Christmas cookie! Thank you for the step by step. I can’t wait to try and make them. Pomegranate cocktails are delicious with everything!